Doc's Talk: What is Egypt ultimately facing with the Israeli war on Gaza? What is Egypt ultimately facing with the Israeli war on Gaza? It is not so much that Egypt worries about the fate of Hamas – with which Cairo is openly at odds, to say the least. It is that Egypt, which had suffered a considerable decline in its foreign policy posture over excessive internal engagement, is concerned that it would no longer be the ultimate point of reference when it comes to Gaza – an effective backyard that remained under Egypt’s supervision from 1948 until the 1967 occupation and which is turning, according to the intelligence assessment in Cairo, into a clearly hostile constituency regardless of any affiliation to Hamas. “Let us be clear about one thing; Hamas might deny it all it wants, but the fact of the matter is that 1) Hamas had been involved in destabilising security in Sinai in support of the Muslim Brotherhood, who were ousted by the will of the Egyptian people and 2) Hamas leaders have declined to heed our advice to avert the onset of hostilities a few weeks ago and decided to take the risk at the expense of unshielded Palestinian civilians in Gaza,” said an Egyptian official. According to this and other officials, Hamas leaders rejected the appeal extended by top Egyptian intelligence officials that warned of an upcoming long and heavy military attack by Israel when three of its settlers were taken hostage. At the time, Egypt mediated for their release but, rather than having them freed, Hamas -- held responsible in Cairo for tolerating, if not directly orchestrating, the kidnap and execution of the teenagers -- turned a blind eye until the three were killed. Well into the seventh day of the Israeli aggression that left close to 200 Palestinians killed and over 1500 wounded, mostly with injuries difficult to treat, the concerned Egyptian authorities were getting worried over an unanticipated shift in the so-far relatively passive public reaction against the gruesome images of killing in Gaza, which both private and state-run Egyptian channels have been very economic with. “So far the vast majority has been blaming Hamas and saying that it has been involved in attacks against Egypt, but we cannot really expect this sentiment to prevail for long with the continued attacks from Israel – especially that it is happening in Ramadan, when Muslim sentiments about images of people being killed during the fast are generally emotional,” said an information official source. Concern over a sudden shift in the public mood – with some security quarters openly suggesting that this shift could actually be “orchestrated by the Muslim Brotherhood and their sympathisers” – is not the only cause for worry on the side of Cairo. Other, no less consequential reasons, include the image of Egypt’s recently inaugurated president Abdel-Fattah El-Sisi, who was recently notified by some close advisors of remarks on social media suggesting that his predecessor Hosni Mubarak, who was ousted by the January Revolution, showed more pan-Arab responsibility when it came to Palestinian bloodshed. “Obviously, the dynamics today are very different and, obviously, we have a nightmare of Islamist militants in Sinai, many of whom had been coming through Gaza for over a year; but, ultimately, we cannot afford to pretend that nothing is happening in Gaza,” said the same information official source. Most upsetting to the head of the state and some of his advisors was an article printed a few days ago in one of the American dailies suggesting that had ousted Muslim Brotherhood president Mohamed Morsi been in office he would have been able to reign Hamas in and thus secure a ceasefire, as he did in 2012. The article was not an independent piece; it came along with diplomatic remarks conveyed at the highest level that if Egypt was not up to the job then other mediators, including friendly United Arab Emirates and adversary Turkey and Qatar, would be solicited. On the ground, Middle East international envoy Tony Blair was acting to involve the efforts, views and advice of all these parties along with those Egyptian attempts that were not getting much attention from Hamas. With limited influence on most of the currently confused regional files, said one Egyptian diplomat, Cairo would not compromise its stance on the Palestinian file – “especially if we are talking about arrangements in Gaza”. While Blair was in the region offering ideas over a package that would include the improvement of living conditions in Gaza and the ease of humanitarian suffering in the densely populated, impoverished and besieged strip, and while Qatar and Turkey were trying, with no success to report, to get Netanyahu to agree to a relative easing of the siege Israel has been imposing on Gaza for over seven years, Egypt decided to offer an initiative practically hours before Arab foreign ministers were joining an extraordinary council meeting to discuss developments on Gaza. The crux of the Egyptian initiative -- that was announced as US Secretary of State John Kerry was scheduled to arrive to Cairo, to be followed by the current chair of the European Union Council of Foreign Ministers Federica Mogherini -- is a ceasefire based on what the circulated text of the initiative described as the “ending of Israeli hostilities against Gaza … and ending of the hostilities from Gaza by all Palestinian factions”. Egypt proposed a ceasefire in less than 24 hours and offered to hold talks that could lead to the end of Hamas rocket attacks on Israel and relative ease of the siege – without committing to regularly operating the Rafah border crossing, the only exit for Gaza to the rest of the world not controlled by Israel. The details of the security measures, the initiative suggested, would be discussed later. The Arab League meeting endorsed the Egyptian initiative, which had been received with no comments from either the Israeli side or from Hamas – with the latter suggesting independently that it was not consulted on the initiative and was not willing to play along on those terms. “The trouble there is that Hamas would not want to settle for so little as the parametres of the 2012 ceasefire,” said a source from the Palestinian Authority that is in an open, seven-year-long political quarrel with Hamas. The Arab League meeting also endorsed a list of demands put forward by Palestinian Foreign Minister Riyad Al-Maleki, who demanded Arab support for prompt intervention by the UN Security Council and UN Human Rights Council, as well as immediate relief and reconstruction measures, along with legal demands to hold Israel responsible for its aggression on Gaza. But, as one New York-based and one Brussels-based diplomats suggested, a deal would have to be reached at the regional level first before the UN could move on with any decision-taking. Earlier in the week, the US, which had systematically been asserting the right of Israel to defend itself, blocked a UN Security Council resolution that would have called on Israel to stop its operation against Gaza – as it would have called on Hamas to halt its rockets. The US delegation was also determined not to allow a presidential statement and only tolerated a long negotiated and not very significant press statement. According to informed European diplomatic sources, the US would not want to end the siege on Gaza, but it would want a ceasefire to be promptly negotiated to prohibit Netanyahu from pursuing a ground operation that could “turn into a nightmare”, as one European diplomat in Brussels said. For its part, Hamas would not want to agree to a deal that does not count among its significant gains a systematic opening of the Rafah border – which Cairo officials say is unlikely due to “national security concerns” – the release of Palestinian prisoners and the return of activists who had been expelled out of the Palestinian territories. “The trouble is that with seven days of operation Netanyahu cannot just go back and say that he is done without having a clear commitment on a long-term -- and not just a short-term and not particularly sustainable -- ceasefire,” said a Cairo-based European diplomat. Furthermore, according to one Egyptian official who had been involved in the mediation with Hamas, the Palestinian Islamic resistance movement also cannot settle for less than serious political gains. This would mean, concerned quarters in Cairo agree, that the Egyptian initiative that was offered on Monday would have to be reworked – at least if Egypt wishes to be the mediator that gets the deal done, as it used to under both Mubarak and Morsi. 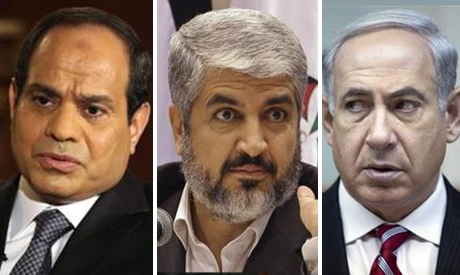 Cairo-based Western and Arab diplomats acknowledge that it is impossible to have a deal on Gaza “without Egypt”. Yet having a deal by Egypt is one thing and having a deal that is not executed without Egypt is quite another, as Egyptian diplomats recognise.